This Amish Friendship Bread snickerdoodle cookie recipe is a Friendship Bread Kitchen favorite. For starters, it yields 60 cookies. Say what? No, you read that right. SIXTY COOKIES. Which means it’s super easy to share, save, or put on a buffet spread. It’s also a versatile. 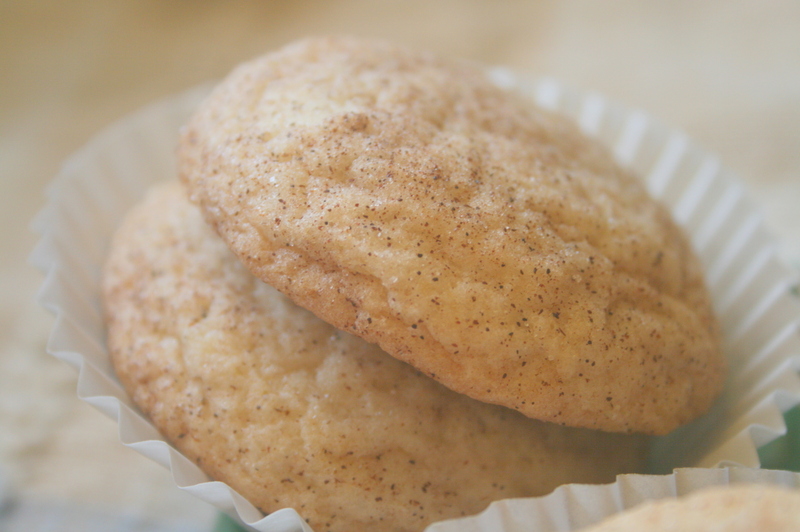 Got some snickerdoodle connoisseurs out there? Instead of 1 cup butter, use ½ cup butter and ½ cup shortening for a bigger snap. Like it soft and tender? Pop them out of the oven between 8 and 10 minutes. Roll them, spoon ’em and drop ’em, make them large, make them small. Keep your hands dusted with sugar and cinnamon and strangers will gravitate towards you for days. 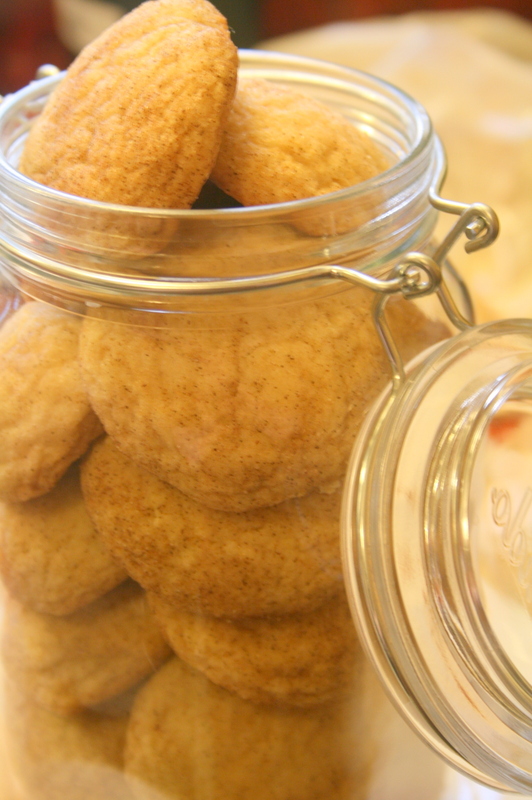 Snickerdoodles were popular in the 1900’s in the Easy Coast, including the Pennsylvania Dutch region, and seem to originate from Germany. There are lots of theories about the true name and origin of this famous cookie, but seems to largely be credited to the German word schneckennudeln, which means cinnamon-dusted sweet rolls, and for a more direct translation, snail dumpling. Ugh. Moving on! Like most of our other Amish Friendship Bread cookie recipes, these freeze well, too, and are perfect edible holiday or hostess gifts. Use your one cup of starter to yield dozens of these cinnamon-sweet Amish Friendship Bread snickerdoodles. In a large mixing bowl, add in wet ingredients. Mix in rest of ingredients except the ¼ cup sugar and and ⅓ cinnamon. In a small bowl, mix together the sugar and cinnamon. Shape dough into 1-inch balls. Roll balls in cinnamon-sugar mixture. Place balls 2 inches apart on cookie sheet. Remove from cookie sheet to wire rack. The dough will be sticky but rolls really well into balls. If you want a crunchy cookie, bake an additional 3-5 minutes. From Deborah Gillespie: "I substituted pumpkin pie spice for the cinnamon in the recipe. It was wonderful and I plan on doing it again." Does the starter have to be the 10 days old to work in this recipe? These are great! Easy & Delicious… my two favorite things. Where can I purchase the jars and/or crocks that you give away in your contests? I see them in alot of your pictures and see them in your comments and would really love to have them. I never seem to win anything…so, is there any way to buy them…if I can afford them that is. 🙂 My Army son loves snickerdoodles & will be home in a few weeks on post deployment leave..so I will be making these for him. I know he’ll love them! very good… hubby and granddaughters enjoyed them. Just made two batches of these and they were delicious. 1/3 C Cinnamon? I did this and it’s way too much. Janelle, I just made these yesterday, 3/12/13. My husband is a Snickerdoodle fiend…the coating of the cinnamon was not to his liking, I had to add a lot more sugar for it to make his approval, I have since written notes on the recipe page I have in my notebook of AFB. Even the texture was not to his liking exactly, so I will need to make further modifications. Can anyone tell me if the butter is melted? Can anyone tell me if the butter should be melted, or just softened? I always soften butter to room temperature for baking…so I would say soften, not melted. It says to use 1 cup Amish friendship bread starter. Do I make the Snickerdoodles before or after I have fed the starter? Sorry if these sounds stupid but you say 1 cup of the friendship bread “starter”. Hope to hear from you. I love snickerdoodles and have never made them. I am so glad to get some recipes to use with the starter. Thanks again. I had made these yesterday 3/12/13…and I always use starter after I have done the feeding. I used softened butter, not melted. Cookies turned out great. just wondering about storage of these? i.e how long they’ll last in an airtight container and also, how they go with freezing? i have my starters and am looking for some recipes i can make in advance as xmas gifts (i want to do a little mixed box/jar of delicious treats)! PS I live in Alaska with a high altitude it takes longer than normal to cook most things an some recipes have to be altered but I am new to this an I am not sure what I need to do to fix my problem!!! We’ve made these several times with great results, so I’d say it could be your ingredients (make sure they are fresh, especially the baking powder and cream of tartar). There’s a good chance, too that your altitude is affecting your outcome. Check the forum (aka the Kitchen Table) for more discussions on high altitude baking, and here’s a great link to King Arthur Flour’s explanation of necessary adjustments for high altitude baking: http://www.kingarthurflour.com/recipe/high-altitude-baking.html. Good luck! I made a HUGE batch of these cookies for thanksgiving. I’m not much of a baker. This recipe was easy to follow and the cookies were great! I currently have three bags of starter brewing, so I will e referencing again in a few days. Since snickerdoodles are one of my favorite cookies, I can’t wait to try this one. Tomorrow sounds good since I have some starter in the freezer! Turned out very well! Just had to use a slotted spatula to squoosh them down a bit. Substituted coconut sugar for white sugar and used white whole wheat flour (25% of the 4 cups called for) to try to make them a tax bit healthier! Is it really 1/3 cup cinnamon? Am really asking for I have never had these before and would like to try them. I tried to make these and sadly failed. I couldn’t roll the dough at all. It became a sticky cinnamon sugar mess everywhere. The small batch of cookies I did manage to make came out more like splats than pretty round goodies. Any advice? I’m not sure what happened but next time I would add flour (and make sure it’s all purpose and not cake flour) until the dough becomes more workable (it will be sticky but you should be able to roll them into balls). You can also chill the dough to help firm it up, too. Make sure all your ingredients are fresh, especially the cream of tartar and baking soda. Also make sure your oven is properly calibrated — cookies are less forgiving if temperatures run too low or too high and can spread too much or not enough. If your starter is runny instead of thick (like pancake batter), I would definitely up the flour a bit. I hope this helps and that you’ll give it another try sometime! Did you add cinnamon and sugar for rolling the cookie dough balls in before you place them on sheet to bake? If you the cinnamon sugar mixture for coating outside in the recipe it would explain consistency you describe. Just toss dough balls in sugar cinnamon mix before baking. Hi Renae! This recipe uses a cup of Amish Friendship Bread starter, not the bread recipe. So follow the directions above by adding just 1 cup of the starter to the rest of the listed ingredients. Does this help? I love making these cookies! My 9 yo. son just asked for them last week as part of our Christmas cookie baking this year. I even made them for my daughter’s wedding reception 2 years ago. I pulled some starter from my freezer and I’m ready! I’m also making some to share for my son’s Christmas concert coming up this weekend. Thanks for the great recipe. I can’t wait to try these! One question – do you use an electric mixer or do you mix by hand? Since the instructions on baking day say not to use a metal bowl, I wasn’t sure if that would apply to mixing with my metal attachments on my mixer. Thanks so much for your help? Hi Beth! Either one is fine — just don’t use something that’s not coated (like cast iron). Have fun and post a picture when done — we’d love to see it! I just pulled the first tray out of the oven and the 2nd tray is baking. For me, I will be getting 4 dozen cookies from this recipe. Like everyone else, I too think 1/3 cup cinnamon is way to much for rolling the cookies in; so I used 2 Tablespoons sugar and 2 teaspoons cinnamon to roll my cookies in and this was just the right amount for me. I baked the cookies for 9 minutes and they turned out lovely. I love how many cookies we get from this one recipe! Thanks so much for sharing, Althea, and happy holidays!